ROCHESTER, N.Y. -- The Rochester Red Wings have been nominated by the International League for the John Henry Moss Community Service Award. The award is presented to a Minor League club for their ongoing commitment to charitable service and their support and leadership within the community and the baseball industry. The honor was created in 2013 by Minor League Baseball in honor of the late John Henry Moss, who founded what would become the South Atlantic League in 1959 and headed the circuit until 2007. 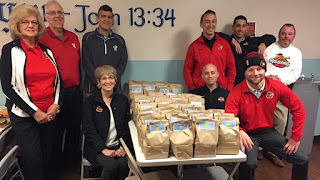 Community is the team's middle name in Rochester, where over eight thousand community members came together in 1957 to form Rochester Community Baseball and keep the Red Wings in Rochester. The team has continually developed partnerships with local socially concerned organizations, lending support in a variety of formats such as programs, promotions, awareness events, charitable contributions, appearances, volunteer service. "The act of doing, giving and participating is more a way of life for us than a concerted effort," Red Wings President Naomi Silver said. "In baseball, we all know that the impact that we make on a community goes well beyond what we do inside our fences. It's the outreach we make the other 295 non-game days a year that allows us to really make a difference. In Rochester, we treasure our role in giving back in support of our community. Since 1957 when the Red Wings became incorporated as Rochester Community Baseball, we have taken our commitment seriously. It is a tremendous honor to be recognized outside of our own community." "All Minor League Baseball teams are involved in their community in many positive ways, but the front office of the Red Wings takes this to another level entirely," said International League President Randy Mobley. "From the very first person on the organizational chart to the very last, all are involved in multiple community organizations and many serve in multiple leadership positions. The breadth and depth of the commitment by this staff to 'do good' in the community is not only commendable, but truly inspiring. The Red Wings front office is a wonderful example for us all." The award will be presented at the Winter Meetings Awards Luncheon on Monday, December 10 in Las Vegas.